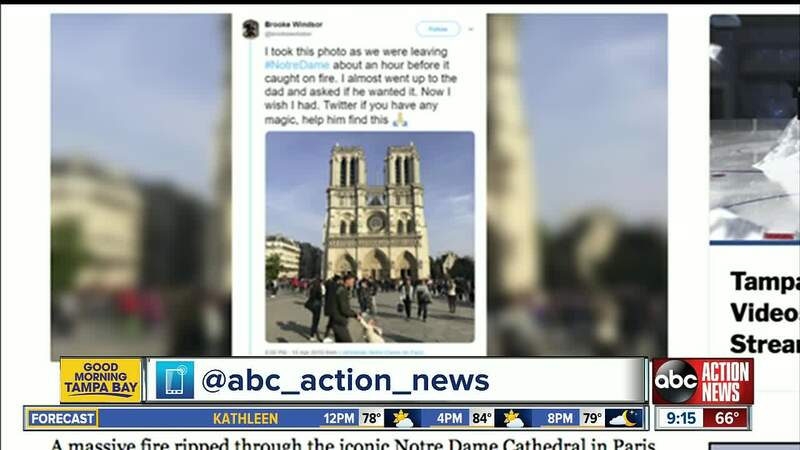 A Twitter user who claims she took the heartwarming photo of a man swinging a little girl in front of the Notre Dame Cathedral in Paris an hour before a massive fire ravaged the historic cathedral is hoping she can find the man in the photo and share it with him. A massive fire ripped through the iconic Notre Dame Cathedral in Paris on Monday and an hour before the fire started, a very special moment was caught on camera between a man and a little girl — but they may not even know the photo exists, that is, until it reaches them via social media. That's what the person who took the photo hopes will happen. Brooke Windsor took the photo and now she's trying to make sure the photo gets to the people in the photo after Monday's devastating fire. The photo was one of the last snapped before the fire so Windsor is making it her mission to find the duo in the photo. Brooke is asking social media to work its magic after she shared the photo on Twitter late Monday night with the caption: "I took this photo as we were leaving #NotreDame about an hour before it caught on fire. I almost went up to the dad and asked if he wanted it. Now I wish I had. Twitter if you have any magic, help him find this 🙏🏼." After her tweet started gaining some traction on Twitter and people questioned her about the relationship of the little girl and the man, she followed up with a second tweet to clarify that she wasn't absolutely certain what the relationship between the two was. She said "@ everyone in my dm’s: - I do not know for sure if it was a dad and daughter, it’s simply the dynamic I observed from them while debating on interrupting this moment. It may be an uncle, brother, friend, who knows until we find them. -It was taken at 5:57 local time." The original tweet now has nearly 100,000 re-tweets and nearly 200,000 likes (as of 8:25 a.m. EST Tuesday). One thing is for sure, the internet wants to help get this photo to the man and the little girl seen in the photo. If you're interested in sharing the photo, click here to see Brooke's tweet and re-tweet it to your followers. Check out some of the tweets responding to the photo. This photo is not only a keeper, it’s historic. Twitter PLEASE do the thing with this one. This is such a good picture.